Large Oval headed, extra long, contoured and lightweight hardwood handle, 35 mm. 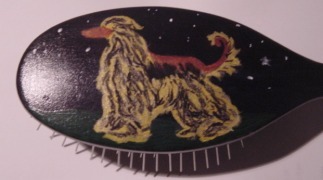 extra long pins are smooth, have rounded tips- brush is offered in Firm with black pad for rough double coats. 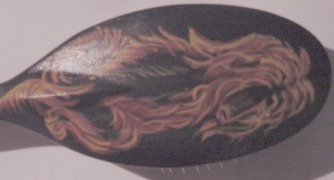 PIN BRUSH "35 MM. WHITE"
Large Oval headed, in regular lenght pins (27 mm.) with white pad, for those who like a little heavier brush but with a soft touch. Ideal for dogs and cats. All the features of our regular Pin Brush in a convenient, oval shaped wooden handle. small, medium, large and triangle. Pure Boar Bristle firmly seated in a comfortable olive wood handle; surpasses all other in construction, performance and looks; recommended for Collies, Shelties, Bobtail, etc. This one is the one the Poodle people rave about; it is 9 1/2' long, handmade from brass/steel and chromeplated, the teeth length is 1 1/2' including the handle, teeth are spaced 5 to an inch, all spaced evenly. The chrome plating does not wear off like many leading brands. Constructed of brass and steel, beautifully finished in nickel, this comb is hand made from its non slip handle to its extra smooth teeth. Also the nickel finish does not wear off like many leading brands. 7 1/2"' long with 1 1/16' teeth spaced 11 to an inch on one half & 8 to an inch on the other - Medium/Coarse. The Fabulous De-Matting Comb helps you divide and conquer even the most stubborn mats. 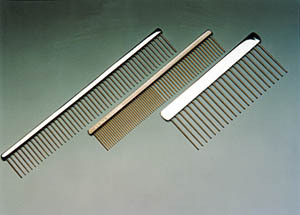 De-Matting Comb has pins which are evenly spaced. It is constructed from the most durable rust resistant steel available, the handle is made from brass & nickel then the entire comb is chrome plated. The pins are 2' long, ends and pins are very round, and smooth. The handle is 1/2' wide; comb 6' long. 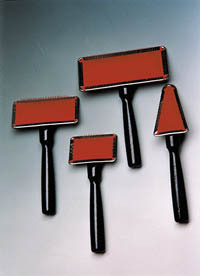 Chris Christensen brushes are manufactured from the highest quality materials in Germany. Experienced craftsmen, who take pride in their work hand finish each tool to perfection. Ergonomically designed tools give you the control and the results you need! 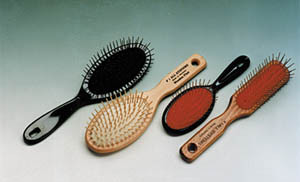 Chris Christensen brushes are manufactured from the highest quality materials in Germany. Their new Fusion brush line offers solid brass pins and are 100 % static free. Beautiful handcrafted Beechwood Slicker Brushes by Chris Christensen. 1 1/2" x 1" Body Length 6"
1 1/2" x 1/2" Body Length 8"
2" x 2 1/2" Body Length 6 1/2"
2" x 3 1/2" Body Length 6 1/2"
2 1/2" x 5" Body Length 7"
4" x 2 1/4" Body Length 7 1/4"
4" x 3 1/4" Body Length 8"